A baby who had surgery on her spine while still in her mother’s womb is home with her family and “doing brilliantly”. 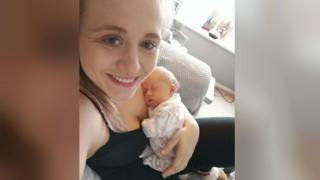 Bethan Simpson, 26, from Essex, was told her daughter Elouise had spina bifida at her 20-week scan and was advised to terminate the pregnancy. However, she opted for pioneering “foetal repair” surgery, which has only been carried out on a few UK women. Two-week-old Elouise “shows no signs” of the condition, her mother said. The “very hungry” newborn is back at the family’s Burnham-on-Crouch home, as the Daily Mail first reported. Mrs Simpson, 26, underwent a four-hour operation during which her womb was opened and her baby’s bottom exposed, allowing surgeons to “sew up” a tiny gap in Elouise’s lower spine. She and husband Kieron were advised to terminate the pregnancy after the condition was diagnosed, but said the decision to opt for foetal repair was a “no brainer”. “I couldn’t justify terminating a child I could feel kicking,” the mental health nurse said. The procedure at University College Hospital in London was deemed successful and Elouise was born on 1 April. “She came out literally kicking and screaming – and peeing all over the place – so she ticked all the boxes,” Mrs Simpson told the BBC. The family had been warned to “expect the worst” but their “incredible” baby girl came home a week ago. “She has slightly enlarged ventricles, which she always did have, but her kidneys, bladder and hips are all normal and she has sensation right down to her toes,” Mrs Simpson said. Elouise is on antibiotics “as a precaution”, her mum said, but “her baseline is so good the doctor hopes the effects of spina bifida will be minimal”. “We hope she will learn to walk and talk like a normal baby,” she added. Mrs Simpson’s surgery was funded by a charitable trust set up by the hospital which carried out her surgery and Great Ormond Street. But NHS England has confirmed that spinal surgery for unborn babies with spina bifida will soon be routinely available. Mrs Simpson is thought to be the fourth patient to undergo the surgery in the UK, with the procedure mostly carried out in Belgium and the United States. Spina bifida literally means ‘split spine’, and occurs when the spinal column and cord are not properly formed in pregnancy (before the sixth week) – leaving nerves exposed. It occurs in around four in 10,000 pregnancies. The cause is unknown, however mothers are encouraged to take folic acid supplements to reduce the risk of developing spina bifida in early pregnancy. Babies born with the condition can become paralysed, suffer bladder and bowel problems – and it can affect brain development. It is estimated that about 80% of mothers choose termination when spina bifida is diagnosed, although the condition varies in severity. The delicate surgical procedure involves opening the uterus and closing the gap in the baby’s back while they are still in the womb.